Alexander Litvinenko, a former Russian security officer who has died in a London hospital after apparently being poisoned, was a fierce critic of Russia's government. Born in the Russian city of Voronezh, Mr Litvinenko first became a security agent in the FSB's predecessor, the Soviet-era KGB, after transferring from the military. He rose to the rank of lieutenant-colonel. He is reported to have fallen out with Russian President Vladimir Putin, then head of the FSB, in the late 1990s, after failing to crack down on corruption within the organisation. The nature of his job, as a specialist in fighting organised crime, meant he would certainly have made enemies. Intelligence analyst Glenmore Trenear Harvey said of his friend: "He headed up one of the internal investigations branches that was looking into the corruption and coercion that was going on within the Russian intelligence service so he made a lot of enemies way back then." Mr Harvey points to links between renegade former KGB officers and the Russian mafia. Mr Litvinenko is thought to have been close to journalist Anna Politkovskaya, who was shot dead last month in Moscow, and said recently he was investigating her murder. She was another opponent of the Kremlin, and particularly the war in Chechnya. Mr Harvey said Ms Politkovskaya was carrying out investigations into corruption and it was likely Mr Litvinenko would have been privy to those inquiries. 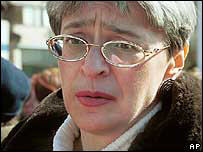 It was after being handed documents relating to the murder of Ms Politkovskaya that he was taken ill more than three weeks ago, he said. 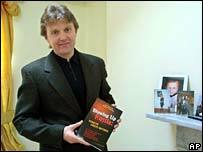 Mr Litvinenko wrote a book in which he alleged Federal Security Service (FSB) agents in Russia coordinated the 1999 apartment block bombings in the country that killed more than 300 people. The Russian government has always maintained the blasts were the work of Chechen separatists. In 1998, Mr Litvinenko first came to prominence by exposing an alleged plot to assassinate the then powerful tycoon Boris Berezovsky, who himself now lives in self-imposed exile in the UK. Mr Litvinenko was subsequently arrested on charges of abusing his office, and spent nine months in a remand centre before being acquitted. Later he wrote Blowing up Russia: Terror from Within, in which he said that it was FSB agents and not Chechen rebels who carried out the apartment block bombings. The attacks helped swing public opinion behind Russia's second war in the breakaway Chechen republic, which began with a huge Russian military offensive later that year. Complaining of persecution, in 2000 Mr Litvinenko fled to the UK where he sought, and was granted, asylum. But after settling in an unnamed London suburb, the former spy - who had a wife and teenage son - continued to behave as if on the run, constantly changing his contact details. Well aware of the methods of those who work in the shadowy intelligence underworld, he met contacts at busy, public locations. The Times newspaper reported in May 2005 that someone had tried to push a pram loaded with petrol bombs through his front door. Despite all this, in an interview four years ago, Mr Litvinenko said: "I believe Russia will rise again and that I will manage to return again to the motherland and Moscow." Appearing alongside high-profile opponents of Mr Putin, Mr Litvinenko continued to make allegations about his former bosses. Perhaps most notably, he alleged that al-Qaeda number two Ayman al-Zawahiri was trained by the FSB in Dagestan in the years before the 9/11 attacks. He also denounced the war in Chechnya as a crime, called for Russian troops to be withdrawn, and said compensation should be paid to Chechens. One of his friends - and one of a number of Russian exiles now settled in Britain - is Akhmed Zakayev, a former Chechen commander living under asylum in London. The two men lived on the same street in London, it has been reported. In the past, Russia has asked Britain to stop exiles such as Mr Berezovsky and Mr Zakayev making what it calls "slanderous statements" about the Russian regime. Russia has repeatedly sought their extradition.